Just a minor correction, that's actually from a Gundlingen, the one you posted on page one in this thread. It's a very interesting one, as it's one of the very rare examples of a Gundlingen with hilt remains. The sword in question was not only Gundlingen (rather than Mendelheim) but it was in Grave 299 rather than 99. 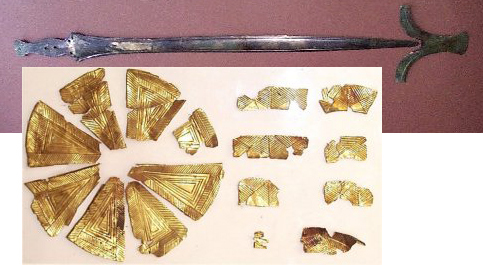 The TOMBA site also has a color image of the sword as well as the gold foil. It dates from Hallstatt C1b (730-660 B.C.) The grave has a mixture of both male and female grave goods. It is believed that it is a mix of two graves 299 and 295 which is situated directly above. The reconstruction of this sword is one of my next projects. I have to buy the plated gold foil, the sword will be grinded and the hilt - the wooden parts - will be finished this week. I have to use gold - it´s the only way to make a better sword then Jeroen´s one! That is a beauty, Steve. Well done. That´s a prob with my pic-server - but after a few times "refresh" it should work! That's an outstanding job Steve. It's nice to see others branching out into these less-covered areas. Very nice. Ok, correct me if I'm mistaken, but does the workmanship in these very old blades seem to far surpass that of medievil swords? The tang flows as if one with the blade itself, not just like some necessary projection... Certainly got my attention! I wouldn't say they would surpase the workmanship of medieval swords (every design feature has it's reasons), but they were definately very good at what they were doing in the early days. Especially considering that they perfectly copied the bronze swords into iron versions, when forging iron was only just introduced. As bronze was cast, complexe shapes weren't that much more difficult, while in the case of forging that's and entirely different matter. Very nice, Steve. Excellent workmanship!!! Yesterday i get my new bronze Mindelheim-sword from Neil Burridge. Looks like a very-well-preserved original blade! Authentic alloy, clear lines, i have only to drill the holes for the rivets, to hammer the angle-nail for the pommel and to carve the hilt (wood or ivory). It´s a 1000gr-bronze-monster, length 83cm! Neil suggests on his site that he is going to cast bronze hilt components (or maybe I'm getting confused with another sword)? She's a deusey! Will you post a picture of the completed sword? When i´ve finished the sword, i´ll post some pics. Posted: Fri 26 Jan, 2007 10:25 am Post subject: Mindelheim from the UK! 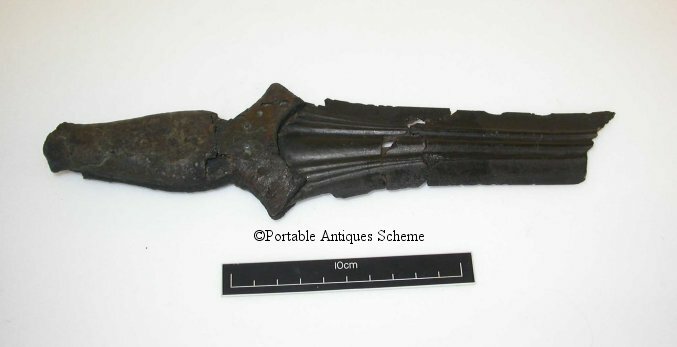 Neil Burridge just send me an image of a mindelheim sword found the UK, the first one I've seen so far. It was found as part of the Llyn Fawr hoard, after which the last period of the bronze age was called (Llyn Fawr phase, 800-700BC). 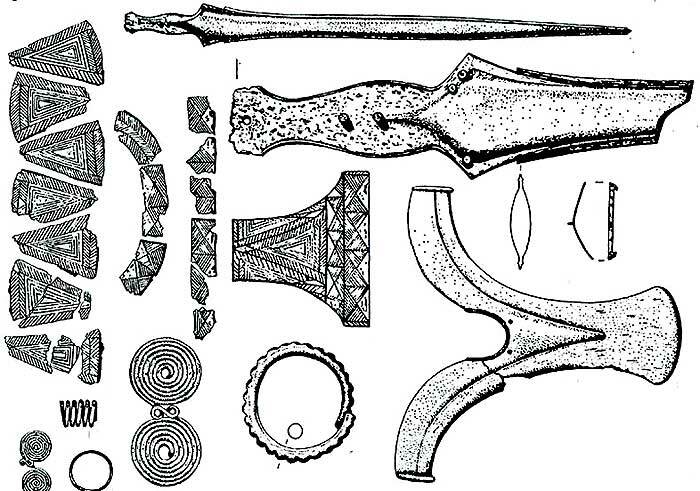 The sword is generally described as being iron, and the earliest occurence of iron in the UK. However, Neil noticed that the blade can never be iron, but has to be bronze. And I agree. The blade is far to crisp to be iron, and the patina is also typical for bronze. However, the hilt plates do look like they're iron! That's a pretty unique combination. So far I've seen bronze mindleheims with bronze hilt parts, iron mindelheims with bronze hilt parts and iron mindelheims with iron/bronze hilt parts. The blade looks very nice on this one, very close to the blade on the Kemmathen sword which Neil is selling. One note: please don't redistribute the image. Neil asked for special permission for me to use it. Posted: Fri 26 Jan, 2007 7:16 pm Post subject: Re: Mindelheim from the UK! The remaining details look beautiful on that blade! Thanks for posting it, Jeroen. Hiltplates of hazlenut, glued with birchtar and riveted with bronze. Pommel of hazlenut too, hideglued on the hilt and fixed hot on the tang. There´s a bone disc under the bronze phalera for accurate pressure.